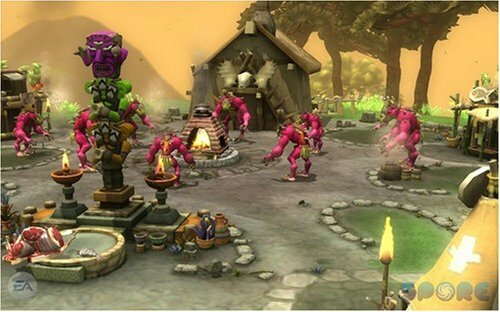 The creators of The Sims present the next big bang - SPORE. Create your unique creature and guide it on an epic journey through a universe of your own creations. Play any way you choose in the five evolutionary phases of Spore: Cell, Creature, Tribe, Civilization, and Space. How you play and what you do with your universe is entirely up to you. Spore gives you a variety of powerful yet easy-to-use creation tools so you can create every aspect of your universe: creatures, vehicles, buildings, and even starships. Create universal wonder in Spore, an exciting new simulation game that lets you develop your own personal universe. Work your way through five evolutionary phases, including Cell, Creature, Tribe, Civilization and Space, that offer unique challenges, thrills and goals. For example, you can start in Cell and nurture one species from a simple aquatic organism all the way until it becomes a sentient life form. Or you can jump right in and begin building tribes and civilizations on multiple planets. What you do with your universe is totally up to you.The powerful creation tools of Spore are easy to use, allowing you to effortlessly design every aspect of your universe. Creatures, vehicles, building and even starships are all within your grasp. While Spore is a single-player game, your creations and other players' creations are automatically shared between your galaxy and theirs, offering a nearly limitless number of worlds to visit and enjoy. You can also go online to view the incredible things other players have made and can even pull those items into your universe. 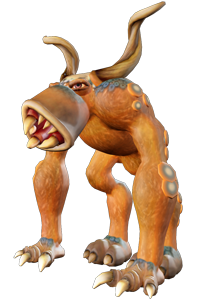 Spore gives you the chance to make worlds and beings that evolve, grow and delight you every step of the way. Finally all that hard work creating the perfect being can be put to good use. Import creatures that you created with the Spore Creature Creator and watch them live, breath and thrive in the full version of Spore. While Spore is a single player game, your creations and other players' creations are automatically shared between your galaxy and theirs, providing a limitless number of worlds to explore and play within. Internet Connection Required. Evolve Your Creature through Five Phases - It's survival of the funnest as your choices reverberate through generations and ultimately decide the fate of your civilization. Explore Other Players' Galaxies - Will your creature rule the universe, or will your beloved planet be blasted to smithereens by a superior alien race? EA will not stand behind this product! I purchased this game from Amazon. It would not accept my license key. I contact EA tech support. After 10 days, they informed me that they issued the license key that was printed on my manual to someone else, the DAY BEFORE I purchased the game. Their fix, return the game to the store and get a new one. No store will allow the return of open shrink wrapped software, thanks to company policies developed by the arm twisting of companies such as EA. I will now try Amazon's return policy to see if they will make an exception to take it back. The correct answer here is for EA to issue me a new key as I requested, and not to further inconvenience me. I have heard NOTHING from EA after their lame solution attempt. Having DRM is bad enough, not standing behind your product when a legitimate customer has an issue is flat out not acceptable! The creature creation, the vehicle editors, the ability to design even the buildings they live in is pretty interesting. But once its designed there's relatively little to do. The actual game is really pretty simple. Still, playing that simple game with something you designed, something unique to yourself if not to be under-rated. It's not "fun" like most games because it doesn't so much reward you for reaching goals it sets for you. It rewards you for reaching goals you set for yourself. I was dumb enough to get the Galactic Edition so I feel like a real heel right now. The game constantly crashes, takes forever to load, doesn't have clean graphics (the planets are frequently rendered without surfaces where there should be water), and ultimately, the game play is dull. As another reviewer mentioned the importance of evolution, gone. Not even a hint of benefit for having any more or less parts of any one kind or any other. I was actually looking forward to this more scientific approach as it would allow for infinitely more options and results when it comes to final character manifestation. If I had known about the DRM ~before~ I bought the game I wouldn't have even bothered. Since I'm out the cash anyway I figured I'd play it on an isolated computer. It works well enough on my MacBook Pro with 4GB RAM but the character creator and the other creator type apps don't work at all on the Mini. Again, the box wasn't clear that not ALL Intel based Macs can run this. Shame on EA for their behavior. While I understand the annoyance of the DRM-complaints, the game itself is a separate topic, and should not be detracted from. This is one of the coolest games I have ever seen or played. I purchased it for my seven-year old right when it came out. My son is very interested in evolution, science, computers and critters. He loves it and has had many happy hours playing Spore, both alone and with friends taking turns creating and running each other's creations. I feel it has taught him valuable lessons about getting along with others (making allies, standing up to bullies, working as a team, etc) that he has turned around into real-world behaviors, and it has been exciting to watch him express his creativity in his Spore creations. Spore is very VERY well done, and I think it was worth every penny - I'm very glad I bought it and look forward to the Galactic Adventures expansion pack coming out. Fantastic game, lots of fun! First of all I have to laugh at all the people depriving themselves of a great game because of the DRM that it uses. Especially when most of their "facts" about the DRM Spore uses and DRM in general are all based on wild speculation, misinformation, and outright lies. All I can say to them is, "Your loss, not mine!" Amazon's customer review system is intended for customers who have bought and used the product to relate their experiences to other customers considering buying the product. None of you have bought Spore, nor have you played it. So your reviews don't belong here and should simply be deleted! IMO you are just abusing Amazon's customer review system which makes you no better than the DRM you hate. I have lots of games protected with SecuROM and it never gives me any trouble so I don't understand all this hatred for it unless it's because you want to share your game with friends and the DRM system won't let you. To that I say, "Good, that means the DRM is doing what it was designed to do." For everyone else, ignore all the doom and gloom criers and get Spore! It's a great game that you can play over and over again because each time you play will be different. Sure the basic them and plot (if any) will be the same but unless you make all the same choices throughout the game, it will be a different game. I enjoy trying different things while creating my creatures, some work and some don't, but that's the who fun of the game. Cool! A Book and a Poster AND a Making-of DVD! I was a fool, I did not trust the low rating and comments regarding DRM on Amazon before purchasing this product. But my son really wanted to play it, so I decided to purchase it, and then I found out it's much worse; it a zero-star rating. I'm sure it's probably a great game, but now I can't play it, because I want my son to play. This review is split into two sections: the first section explains the "fun" rating, and the second section explains the overall rating. The game is rather fun (4/5) but not extremely fun (which would be a 5). The first few stages are rather simplistic, almost "dumbed down" experiences. The civiliation stage, and much more so the space stage are where the game really has most of it's content. However, even those stages can become repetitious, and ceaseless attacks in the space stage become annoying quickly. My son loves this game! This is a great game and I'm happy that after several months I finally decided to ignore the negative reviews and buy it. Installing it was easy, but when we first try to start the game nothing happened. I searched the internet for information and tried the advice I found there--remove the disk from the drive and click on the desktop shortcut. For the first two or three minutes it didn't seem like anything was happening, but then the game loaded and my 12-year-old son has played it for more hours than I'm willing to admit. We tried exiting and starting it back up and it still takes perhaps a minute or so but then things are fine. EA, this is me telling you I was going to pre-purchase Spore, Galactic Edition. This is me now saying I will not. Secure-ROM killed my purchase. Take a look at Stardock's success for a business model on how not to anger and annoy your legitimate customers. Spore is perhaps one of the most ambitious games to ever make it to the drawing board. With that said, Spore would appear to have been pulled from the womb prematurely. You will experience the wonders of evolution (sort of) with the ability to design amazing creatures straight from your imagination only to see it all disappear before your very eyes when Spore freezes like a deer in the headlights. On the occasion Spore lets you play uninterrupted for awhile, the game is very enjoyable. The interface is fairly intuitive and the care in design was obviously there. Packaging for the Galactic Edition is great if your are into that sort of thing. I have never had such a bad experience with installing a computer game. The DRM system is awful, unreliable, and wasted a ton of my time. Instead of playing with my kids, I had to be the computer guy for hours. EA is not paying for my time, so that hurt. I am a computer consultant, I know this stuff. I bought three copies from Amazon, so that I could have a copy as well as my kids. From the moment we got locked out of the first install, becuase my 10 year old had a typo in his email address, to problems with Vista, I have tried stubbornly to work through each issue. And at every step, instead of help from EA, I got resistance, denials, and useless suggestions. I am giving up and returning them all. there is no way I can enjoy playing the game after so much pain installing it. Okay, unlike a lot of people, I wasn't expecting anything revolutionary from Spore, so I didn't have THAT crushing disappointment looming... I bought Spore through Steam and played for a long time without registering, due to the 3 time limit, but I eventually gave in and I honestly don't see the appeal of it, but I suppose there are some people who enjoy having strangers boost their ego by downloading their content, etc, so that might be fun for them. There have been far too many complaints about this game for me to ignore writing a review about it. Spore is, quite simply, one of the most perfect games every constructed. If you have ever in your life thought to yourself any of the following: "Biology is kinda cool," "Fighting aliens is great," or "I really like playing god," then Spore is the game for you. As anyone can see by looking up the gameplay footage, Spore has many phases at the players disposal. You start as a single cell, evolve into an animal phase, become a semi-sentient species, build a civilization, and then go into space. All of these phases offer a unique style of gameplay. But I'll be honest, when push comes to shove, Spore is all about space. Once you get into the space phase, it feels as if everything you've done was just a small stepping stone to the mind-bogglingly-large galaxy that Spore has to offer. With countless thousands of stars, almost all with several planets orbiting them, the amount of exploration that the game offers is simply amazing. SecuROM DRM and only three installs allowed? Nope, I won't be buying or playing this game or any other EA product until they stop abusing their customers. I stopped buying their buggy software a decade ago and it looks like they've only gotten worse. SecuROM is just evil. Honestly, I don't care about the DRM. Let me start off this review by pointing out that I am not... by any stretch of the imagination... techno-challenged. I have had computers on my desk since my first Leading Edge Model D and Apple II with CPM card back in 1979 (When I was in the 7th grade). Lots of systems later (I still have a desk with a Mac and Windows machine on it after all these years). I have worked at Apple and other high tech companies in the past. I have seen numerous posts about how only the Admin on a Mac can successfully run Spore. This is simply wrong. You should be the Admin when you install it, but that is all you need. In my specific case, I have an iMac running with 5 user accounts. 3 of them are for my sons(Parental Controls enabled on all three) and with one install on my Admin account, EVERYONE is able to play the game. Of course, if you have lots of parental controls in place you may have to give specific permission for each user to play - but play they can. You also are likely have to run the game in each persons account yourself the first time around. The reason being that when it runs the first time on each account, it is going to tell you it needs admin permission to run various programs that Spore uses - but you only have to do this once to give that account permanent permission to run the game on its own from then on. I have also installed the game on a windows machine, and have had no problems. However, on this system I am the only user, so I cannot comment on how it works on windows with multiple user accounts. The game play is fantastic! While my interests have wandered, my sons are NUTS over this game. It is amazing to watch them exercise different approaches to growing their civilizations. My oldest son decided he would get through it by only making friends... and he did it. One of my other sons has apparently been reading up on Stalin while I am not looking because his approach was very... different. I have lost of how many times my sons have started over - on purpose- so they can create new creatures, try different strategies or design new and interesting architecture for their species. Okay, so the Securom security issue is profoundly annoying. (Lose have a star for that) Frankly, it amazes me that ANY game publisher still uses the system. It only punishes those who pay for the game. I am sure it was a bitter pill for EA when a fully cracked, Securom free version showed up on BitTorrent BEFORE the game shipped. However, having said that, I have not run into any problems with the security present on the disk.